The question intrigued me. When abroad, I am used to being asked whether it was true that all Swiss men had a military rifle at home. 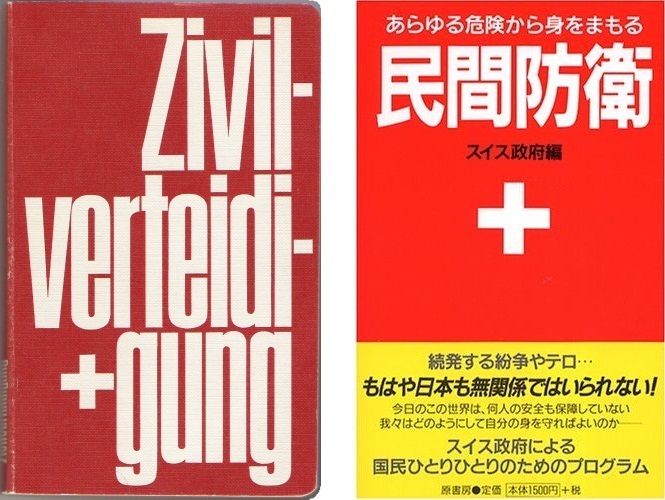 But, before a Japanese friend asked me about it the other day, I had never heard about a book called Civil Defense, which in the 1960s was apparently handed out to every household by the Swiss government. What was she talking about? And why on earth is a dated Swiss book, unknown to me, popular among the Japanese? The volume was known in Switzerland as the “red booklet“, which is a double irony: the ‘booklet’ is 320 pages long and full of anti-communist ideology. Zivilverteidigung (Civil Defense) was published in 1969 and 2.6 million copies were distributed to Swiss households for free. It served two purposes: 1) as a guide for the Swiss population about how to behave during, and prepare for, national disasters, including nuclear war; and 2) to instill a spirit of patriotism and resistance towards everything foreign and dangerous (at that time, mainly communism). The red booklet included lyrics of patriotic songs and, most interestingly, two versions of a story in which Switzerland is threatened by revolutionary forces supported by an outside power. In the first version, written on the right-hand pages of the book, the Swiss people resist and save their country; in the second version, written (of course) on the left-hand pages, the revolution succeeds and Switzerland collapses. Just a year after its publication in Switzerland, in 1970, Civil Defense was translated into Japanese, and that’s not all:　Minkan Bōei (民間防衛), as it’s known in Japanese, was re-published in 1995 and again in 2003. With 150,000 copies sold in all, it isn’t quite a best-seller. Nevertheless, the red booklet remains popular in Japan. Not so in Switzerland, where it was already out of fashion at the time of its original publication: when they started the project in the early 1960s, the Swiss authorities didn’t anticipate the social changes that would occur later in the decade. In the 60s, large parts of Swiss society began to open their minds and reject the ideology of “spiritual defense”, created by the government in the 1930s, first to resist fascism and later communism. Criticized for its harshness towards non-conformism of every kind, by the late 80s even the strongest proponents of “spiritual defense” would have laid Civil Defense aside. Why, then, is the book still so popular in Japan? The answer says a lot about the state of Japan today. There are nationalists in Japan who fear a cultural invasion by South Korea, military attacks by North Korea and even a military invasion by China. These people warn that the Japanese are not prepared to defend against such evils. Waving a book written during the Cold War they point to Switzerland and say: “Look at the Swiss, they know how to defend themselves. They have shelters. Everyone is trained in how to stockpile food for times of emergency and how to behave during a nuclear attack”. What’s wrong with this? Forgive my chuckling, but they are confusing the centuries. In Switzerland, old bunkers have been turned into hotels and shelters are used as wine cellars, but some in Japan still look to Switzerland as a model of civil defense. To be fair, there are many Swiss (and other Westerners for that matter) who practice Japanese martial arts and think of Japan as the land of the samurai. Just this morning in the news I heard about a Swiss man who attacked a police officer with his samurai sword when he was about to be arrested. When there are people who offer seminars on how to apply Japanese sword-fighting philosophy to business, why not learn from Switzerland about how to defend your country? But perhaps people could be more sensitive to historical realities. The samurai age has passed in Japan. So has the age of “spiritual defense” in Switzerland.